Food has always been a passion of mine, as I wrote about in an earlier post, Cheesy Hasselback Chicken, and when I travel it is definitely no exception! Usually, I plan all of my trips around food reservations. While I didn’t really make any reservations on this trip, I still had my list of what I must eat in each country. 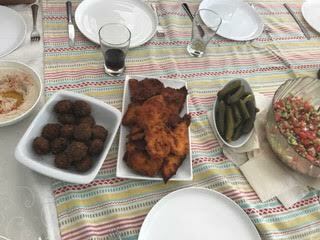 In Israel, I had a LONG, LONG list of everything that I had to eat! Giraffe, no not the animal! 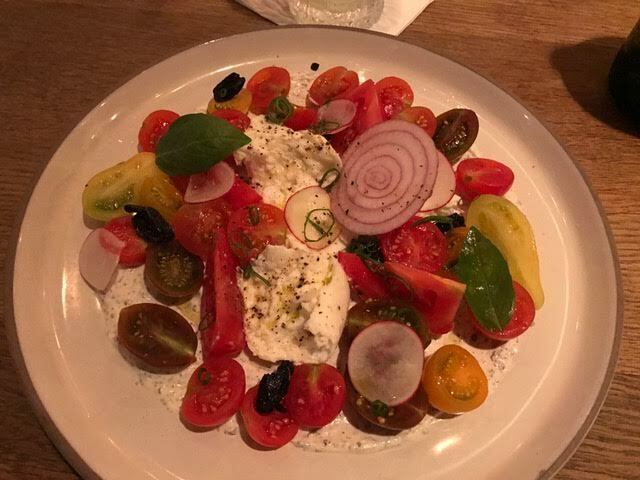 the buffalo mozzarella, tomatoes, mint labane, onions, and olives (second photo), and lastly, the chocolate oyster pearls (dish not listed on the menu). I also tried the salmon, which was the my least favorite dish. most middle eastern restaurants should have a dish with it. 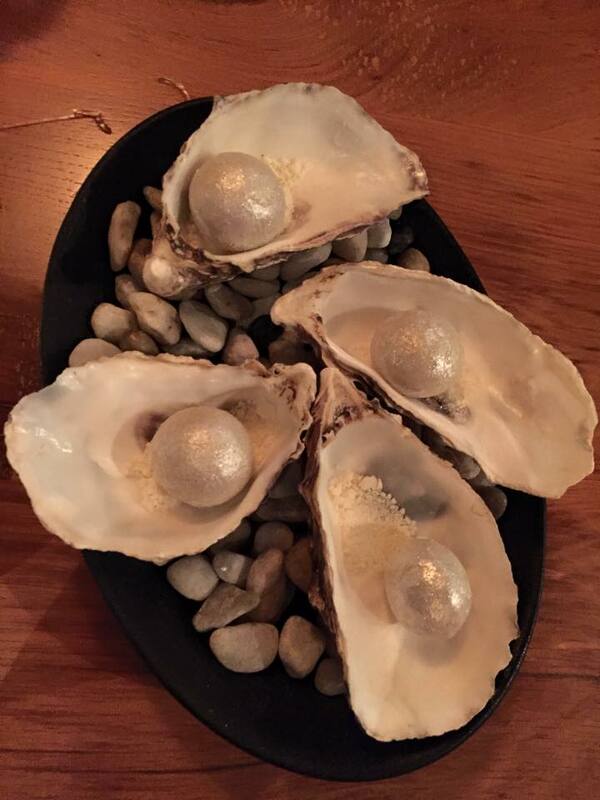 As for the chocolate oyster pearl things, that isn’t technically the name, I just made it up myself, as I do with a lot of things in life, 🙂 these aren’t on the menu. Apparently it’s for ‘special people’ and Jen, being the special person that she is, was able to snag us a few to try. Usually its for their VIP clients… if you know what I mean. 😉 This dessert was unlike any other I have ever tried, and trust me when I say, I have tried A LOT! It was literally a very unexpected chocolate explosion in your mouth. -Insert your inappropriate comment here- JK JK And it was awesome! Fresh fried falafel: NEVER eat falafel that isn’t freshly fried or has been sitting out. It’s just not the same! I have yet to find falafel in the U.S. that even tastes remotely like the ones in Israel. Israeli salad: Everyone has their own take on Israeli salad, but typically it is composed of tomatoes, cucumber, parsley, olive oil, salt and pepper. Some people add in feta cheese, cilantro, or onions. It is a very refreshing and easy dish to make for all occasions! Pickles: OK, you might b thinking, pickles?! BUT OMG, Israeli pickles are unlike any other. They are usually skinnier than the ones we have in the U.S. and I think they are fully sour, as opposed to half sour ones. Some places in the U.S. have similar ones, but they honestly don’t taste the same as any of the ones you would get in the Middle East. Hummus: YOU CAN’T PUT A PRICE ON GOOD HUMMUS. People, the hummus in the U.S., for the most part is well, disgraceful. Sure, I eat it, but man, when you have the real thing, you see what you are missing! When I lived in Israel, I ate it all of the time with a light and fluffy pita bread. Cauliflower: I have absolutely no clue how she cooked this, but it was amazing and seemed pretty simple. I’m guessing, some olive oil, maybe salt, and baked. It was simple, healthy, and tasted great. She also had a few sides such as rice, potatoes, and of course, fresh baked pita bread. I feel like I’m definitely missing a few dishes, but I think you get the gist, it was simply a feast of incredible food! AND WE CANNOT FORGET DESSERT. I can’t say it enough, it was truly such a treat for me and I was SO privileged to be able to spend time with such a welcoming family. When I posted this photo on Facebook, one of my best friends, who happens to be Asian, commented, “IS THAT CHINESE FOOD? !” Yes, it was! At one of my favorite Asian restaurants in Israel, called Giraffe. As most of you know, I lived in Haifa in the northern part of Israeli for a year, and that was where I was first introduced to one of my go-to restaurants in Israel. My wonderful friend, Elissa, and a few other friends, used to go here regularly, and there were times that we even had it delivered to the university. Going back to eat there always reminds me of Elissa! 🙂 I also took my mom to eat there when she visited, and she loved it! 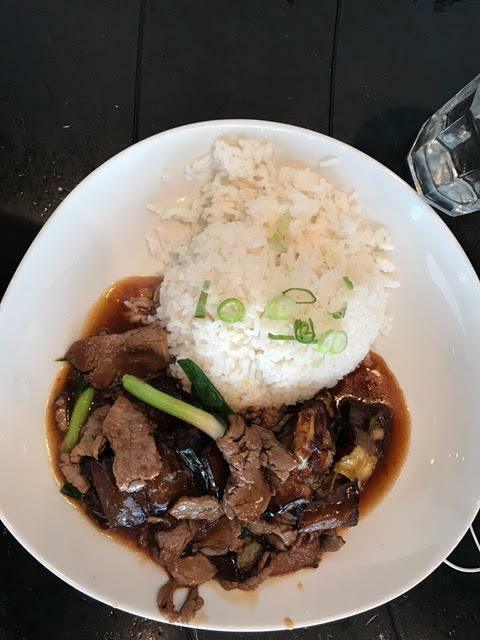 This particular dish, also my favorite dish, called Chieza, is comprised of beef, eggplant, and a sweet bean sauce. Eggplant is a staple in Israeli cuisine, and you see it prepared in a variety of ways, including in your Chinese food. 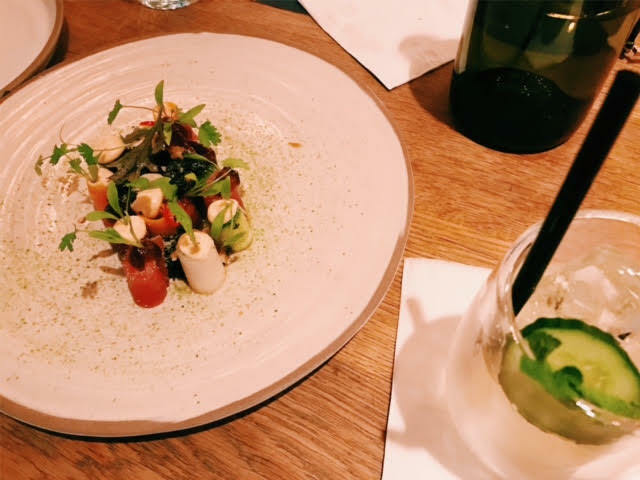 Also, every dish I have ever had there has been quite tasty, so I definitely recommend trying it out if you are in Haifa, Tel Aviv or Eilat. I wish I had taken a photo of the whole stand! Sorry about that! 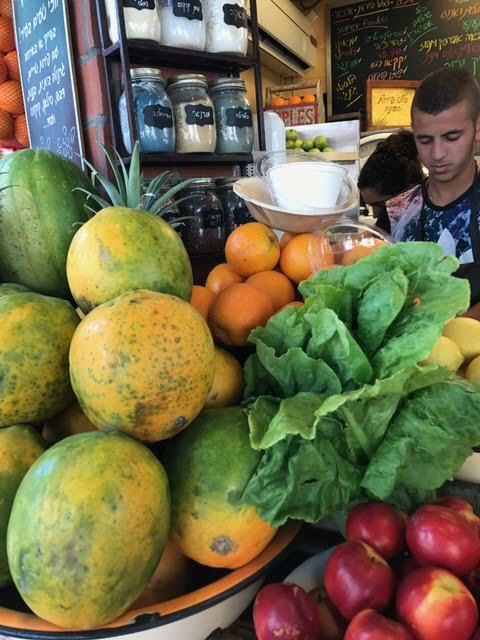 While wandering around Tel Aviv, you are very likely to come across this brightly colored juice stand, with an abundance of fresh fruit, and most likely, a line in front of it! This is very typical for Tamara, my favorite juice stand in Israel. This time, I ordered a smoothie with nectarine, strawberries, orange juice, and banana. You can make a juice or smoothie with literally whatever you like in it, and it is fresh squeezed right in front of you. 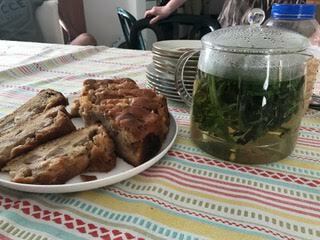 As I mentioned previously, because it’s from within the country, it is incredibly fresh and sweet, and tastes nothing like what you would get in the U.S.